1985 Landcruiser fj60 with 6.0 vortec and auto trans. Spring over 35km2. 10 city 15 highway. 13 combined. I thought that these vortec swaps were getting close to 20. Did your landcruiser do better or worse with the original motor? Did you swap it yourself? A buddy has a triple locked 80 series (blown engine) that I have been thinking about buying. Over the last 2 weeks I put just under 200 on Binky. Driving was a little bit of everything. About 25% Interstate (75-80 mph), 50% 2 lane mountain highways (45-65 mph and very hilly) and 25% mountain dirt roads. I was never light on the throttle, running the beast pretty hard all the time. Just because it was fun : ) I ran pretty close to a fully loaded camp trip. AWD Express, no lift, 265/75/16 Cooper ATPs, fully converted inside so some added weight there. I used to have a 91 e350 with a 460. this man speaks the truth. Nothing could stop that thing, but also nothing could stop it from getting 10mpg. really interesting, the wide variation in reported mpg from the powerstrokes. seems the majority of them are much worse than people tout them to be, not sure it's worth the extra cost over the gas engines for 2-4mpg better. My 5.4 with 33's and 3.73's would get about 10-11mpg, my 6.0 on 35's with 4.30's seems to get 15-17mpg. I'm much happier with the power and increased range of the diesel, but I have read so much bad stuff about the 6.0 that it's always in the back of my mind that there is going to be a problem at some inopportune time. Ford 390 FE motor, C6 automatic transmission, to be honest not sure what gears are in it yet. It should be noted that aerodynamics plays a huge role. Those reporting lower teens for diesel mpg tend to be in ambulances and the like, while the higher teens tend to be closer to stock height vans. Tire size is everything when it comes to these swaps, if you're on a set of 33" ATs you can squeak out 20mpg on a smaller vehicle like and LC on the hwy (keeping under 70mph) but as soon as you switch to an MT and go 35" or above that heavy tire at hwy speed wants your gas...My Jeep Commando is the all aluminum 6.0 on 40" tires...if I try hard I can squeak out 15mph on the hwy.. The more ground clearance, the worse the fuel economy. Many MFGs use a bumper and/or air dam to direct air around, and not under, the vehicle. The underside of most vehicles is an aerodynamic nightmare of axles, hoses, tanks, etc. The less air that goes under the vehicle the better. A 4" lift can drop fuel economy by 20% or more in some cases (at the same speed). Auto trans also burns fuel. 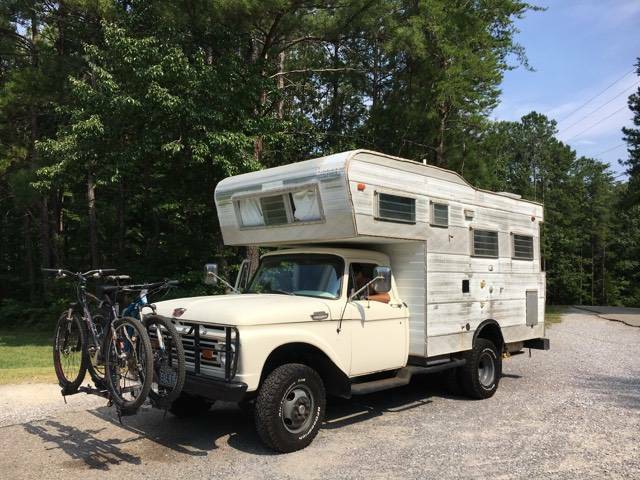 40 series, 4700 lbs, 350 SBC, worn carb, 20 mpg straight highway 55-60mph, 13 mpg in town. Ambulance will do better. I'd restate it, but I can't remember the numbers now... and I was accused of lying last time anyway. I couldn't swallow 7 mpg when the 7.3 has done so much better and has needed very little maintenance. 2016 Mercedes Sprinter high roof; full van build inside; 2.1L DOHC twin turbo 4 cyl diesel w/7-speed transmission = 24-29 MPG. Will actually pull low 30s at lower speeds on secondary roads. I hope diesels continue to live in the United States. If the Mercedes diesel powertrain can pull high-20s MPG at 9-1/2 feet tall, I can only imagine what kind of mileage something the size of the 4Runner would get. 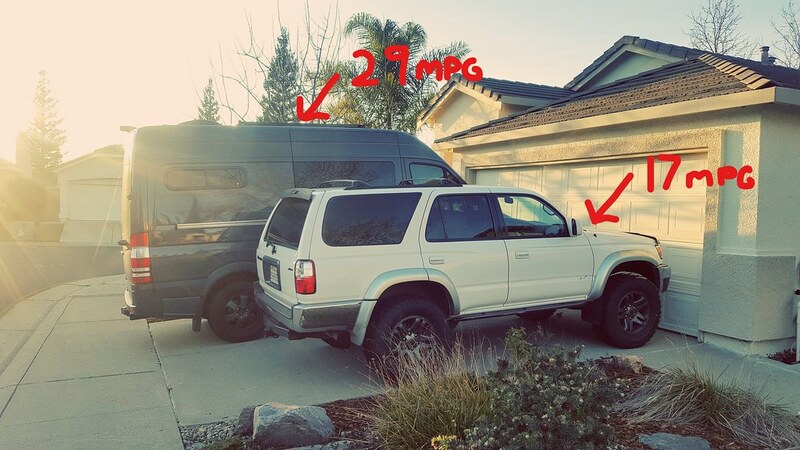 In fact, the only thing I would ever sell my 3rd gen 4Runner for is a small diesel-powered SUV. In fact, the only thing I would ever sell my 3rd gen 4Runner for is a small diesel-powered SUV. Well then, the diesel Jeep Grand Cherokee might be what you want. It’s medium sized, not quite small, but then again it seats only 5 so it’s on the small side. Mine is a 2016 “JGC CRD”, 8-speed auto, with 255/70-18 A/T tires (32”) on a stock Quadra-Lift suspension, and a roof rack with small space case. JGC CRD = Jeep Grand Cherokee common-rail diesel — Jeep calls it the Eco-Diesel, but E.D. is something you buy little blue pills for so I call it the JGC CRD. Using the paddle shifters to upshift a little early and hold a higher gear, and also by not driving fast, lately I’ve been able to get 25-30 MPG on the highway, and 20-25 MPG in the city. If I don’t do that, and if I drive “smartly to assertively”, I get 19-24 MPG in all-around driving. But once, there was one time on a long trip that I tried hyper-miling it — on a flat I-5 from Los Banos CA up to Shasta and then south to L.A., using paddle shifters to set and hold 8th gear, I got 34 MPG for an entire tank. The tank holds 25 gallons, and 34 MPG means that I was able to go 835 miles between fillups on that drive. That 835 miles is the farthest I’ve gone on a single tank, so far. 30-34 MPG is not too shabby for a decently trail-capable 4x4 rig.